Easter is upon us and instead of focusing our attention on the chocolate egg variety, how about we look at the boiled egg variety too. 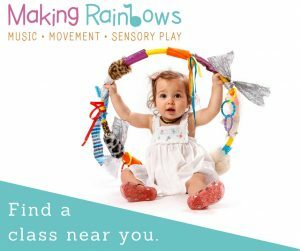 This is a fun activity that my kids loved (and I got a kick out of it too). 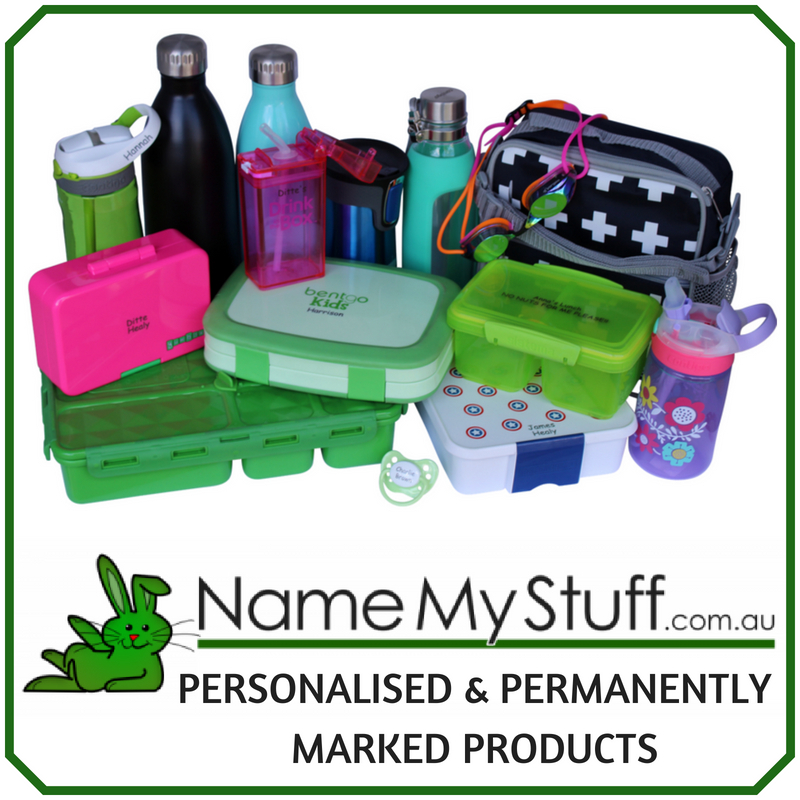 You can create a gorgeous centre piece for your Easter table or dye the eggs and use them in a salad or even send them to school in the kids lunchboxes. My son who never wants a boiled egg at school begged to have the dyed egg put into his lunchbox today. Whether he eats it or not is another matter…. I have used 3 decorating techniques and they are each described below. 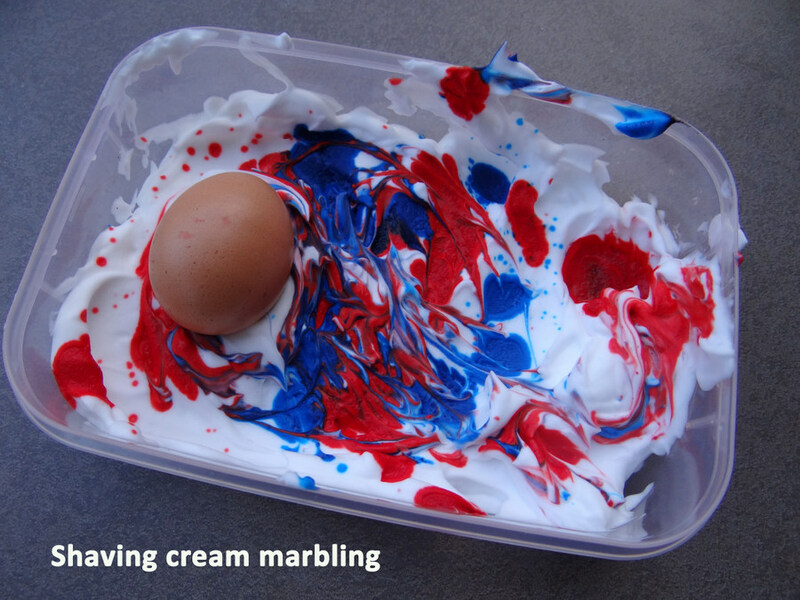 My favourite was the cracked egg effect using food colouring as the results on the actual egg were amazing. Once your eggs have boiled and cooled, use the back of a spoon to crack the shell. Do this gently and try not to lift the shell from the egg. 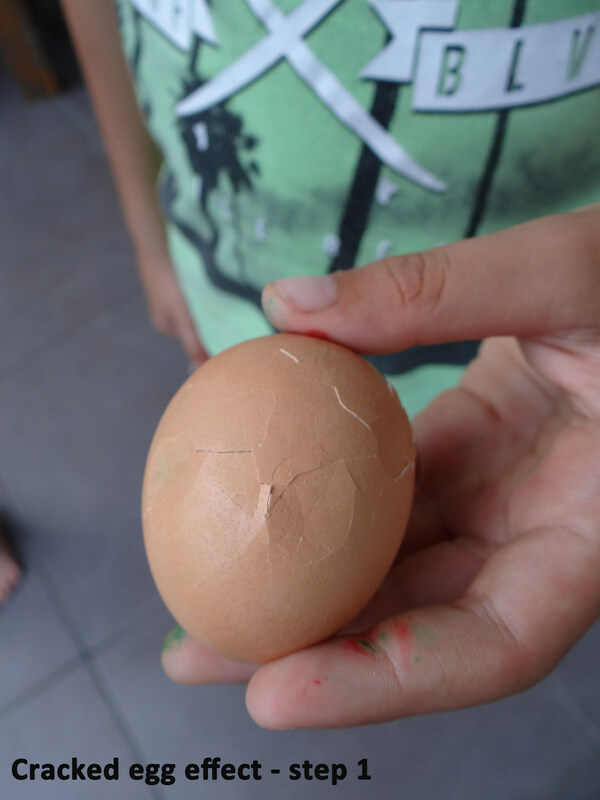 Give the egg a few good cracks around the exterior. 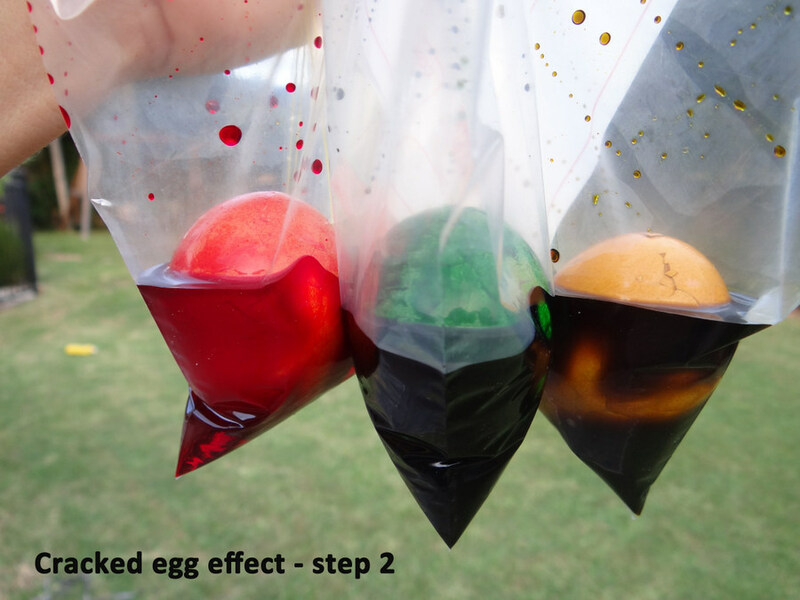 Place the egg in a zip lock bag and pour in some food colouring – approx. 1 tablespoon. Coat the egg in the colouring. 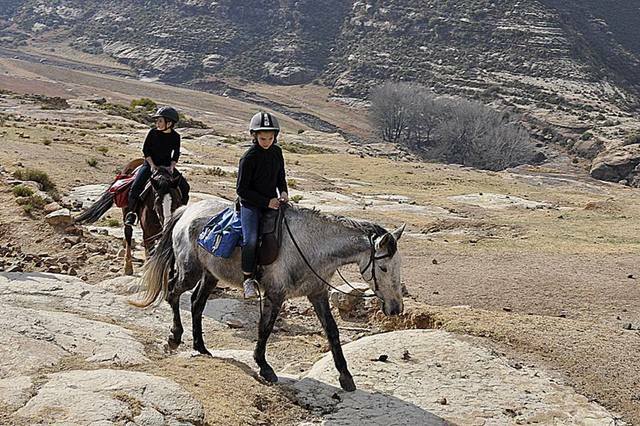 Leave for approx. 20 mins to allow the colour to penetrate the egg. 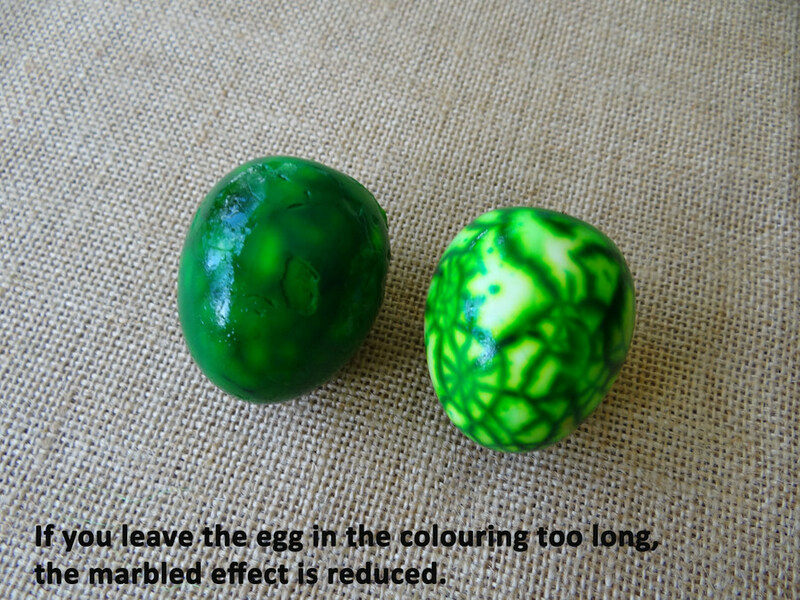 (Note: I left some eggs overnight and the colour penetrated the egg so much that the pattern was non-existent). Remove the egg from the bag and rinse under water. Splash the egg with white vinegar. I just poured some over and made sure the whole egg was coated. Peel the egg and see the amazing results. Boil the eggs and set aside for a few mins to allow to cool slightly. 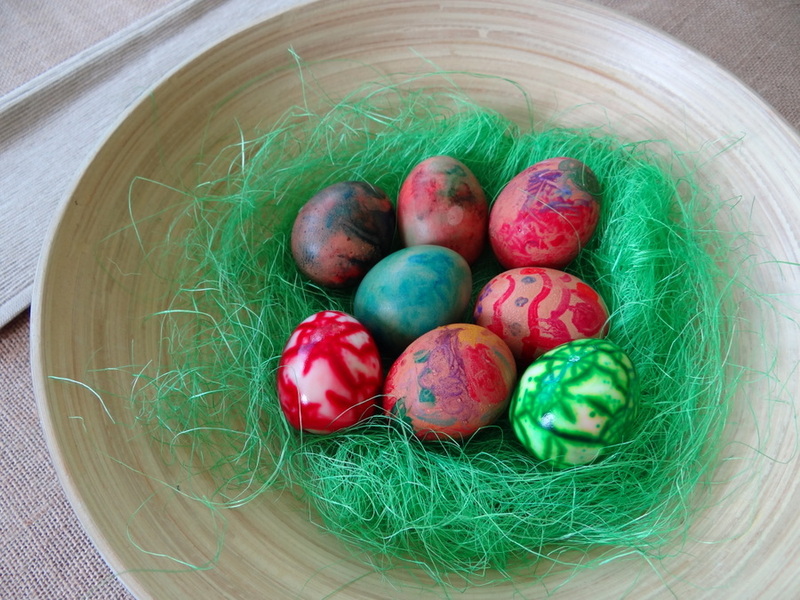 While still hot (but not burning), hold the eggs with tongs and draw on the shells with crayons. 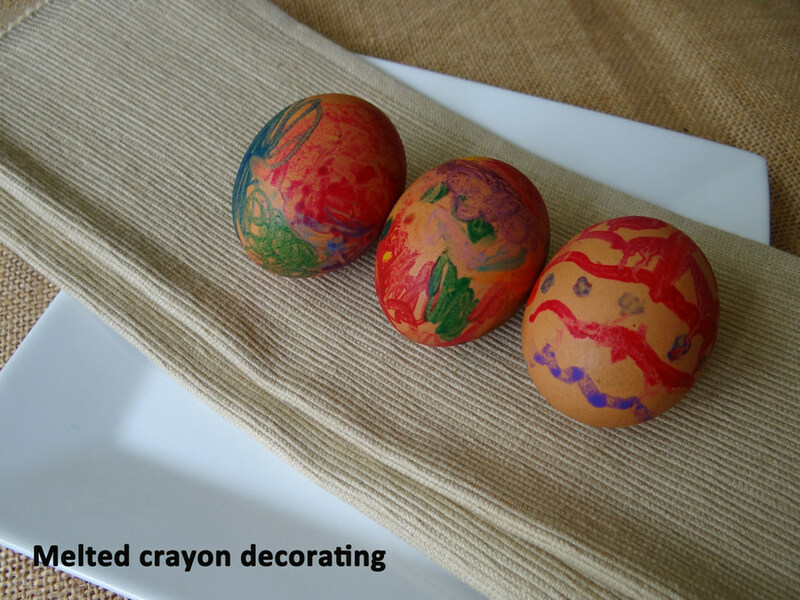 The heat from the egg will melt the crayon onto the shell. 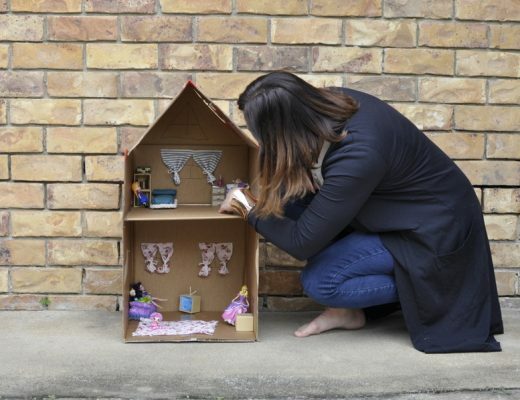 It can get a little messy and the design may smudge but the trick is not to get to fancy. 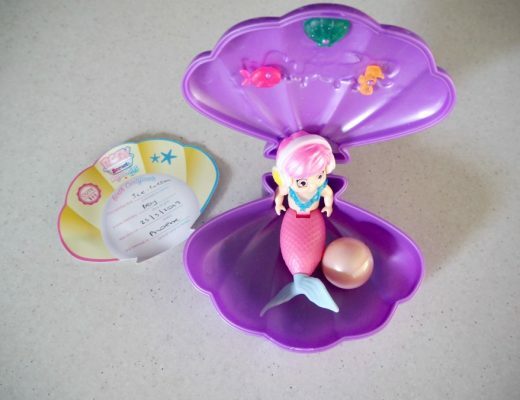 Place in the fridge to cool and the crayon will set on the shell. 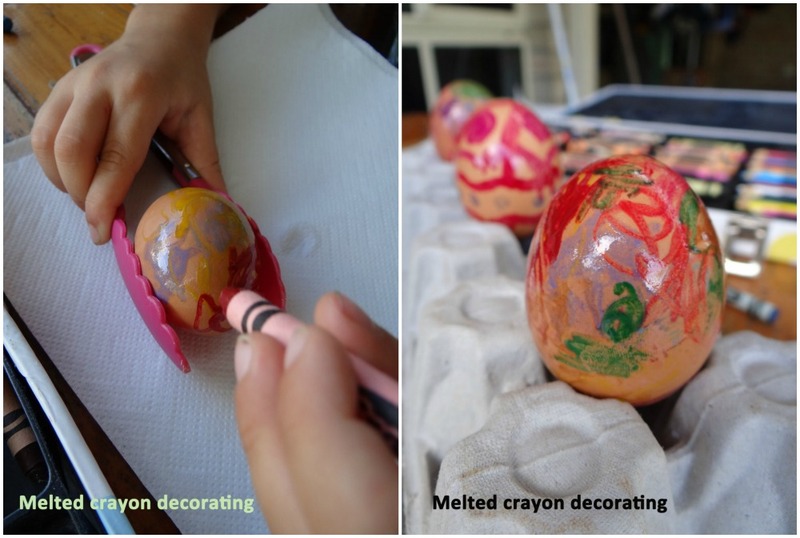 This method does not penetrate the egg and just provides a lovely decorate shell. 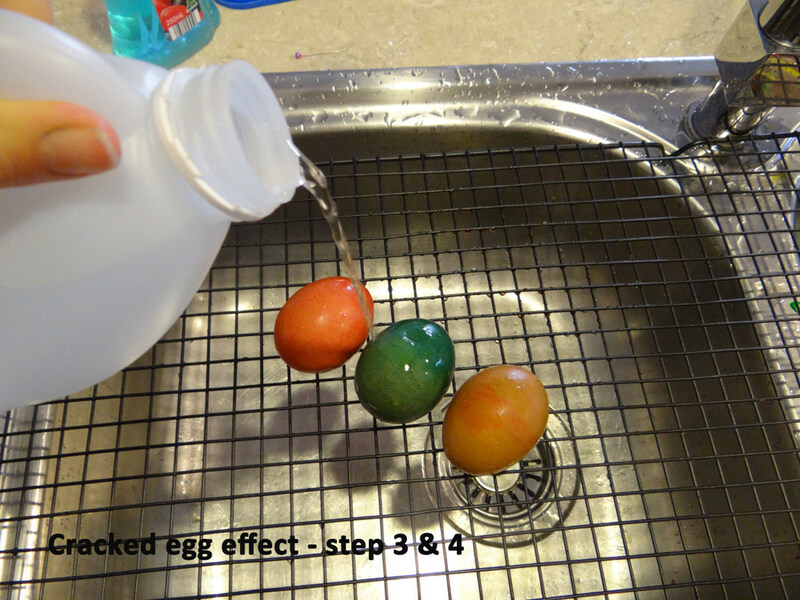 Once your eggs have cooled, you can use them in this activity. Spray the shaving foam into the shallow tray. Spread to cover the base of the tray. 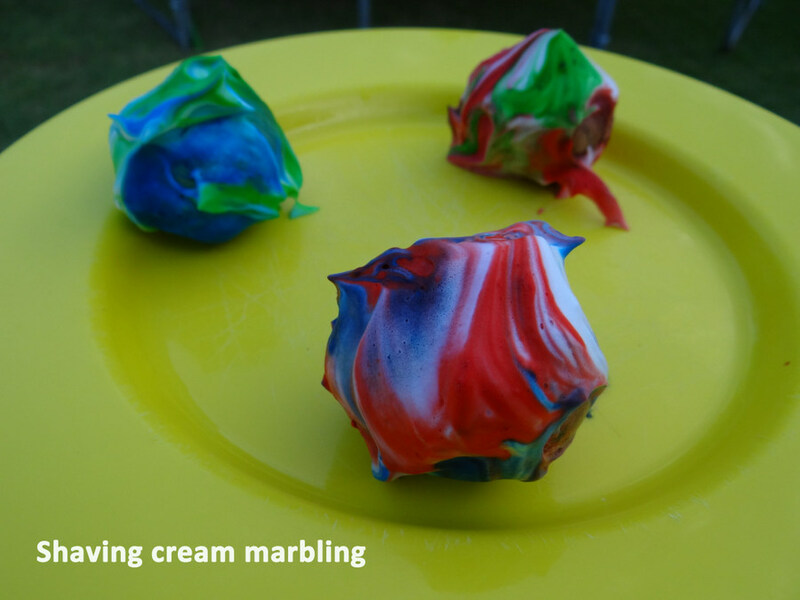 Add some drops of food colouring into the foam and swirl through with a toothpick or similar. Place the egg into the foam and roll to coat the egg. Place foamed eggs on a plate/tray and set aside for 20 mins or until the foam starts to dry on the outside. 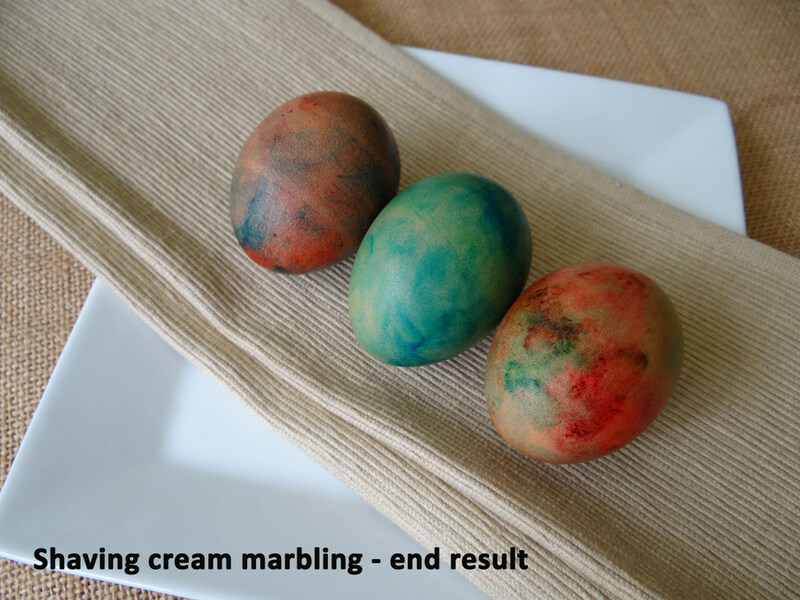 Wipe the foam off with a paper towel and you will see that the egg shell is stained with a marbled effect. This method doesn’t penetrate the egg – just the shell.